Casio is celebrating Baby-G’s 20th anniversary this year with the release of a new Baby-G BGD-500 range sporting the nostalgic design of the classic Baby-G. 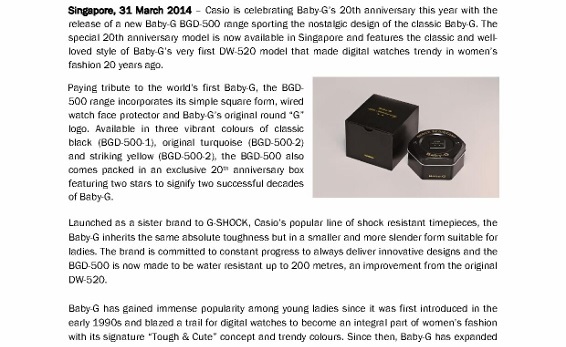 The special 20th anniversary model is now available in Singapore and features the classic and well-loved style of Baby-G’s very first DW-520 model that made digital watches trendy in women’s fashion 20 years ago. Paying tribute to the world’s first Baby-G, the BGD-500 range incorporates its simple square form, wired watch face protector and Baby-G’s original round “G” logo. Available in three vibrant colours of classic black (BGD-500-1), original turquoise (BGD-500-2) and striking yellow (BGD-500-2), the BGD-500 also comes packed in an exclusive 20th anniversary box featuring two stars to signify two successful decades of Baby-G. The special 20th anniversary model is now available in Singapore and in three vibrant colours of classic black (BGD-500-1), original turquoise (BGD-500-2) and striking yellow (BGD-500-2), at a suggested retail price of SGD129.00.